3.3 × 3 cm. Saint Petersburg, The State Hermitage MuseumInv. No. Ж 299. The abduction of Ganymede. 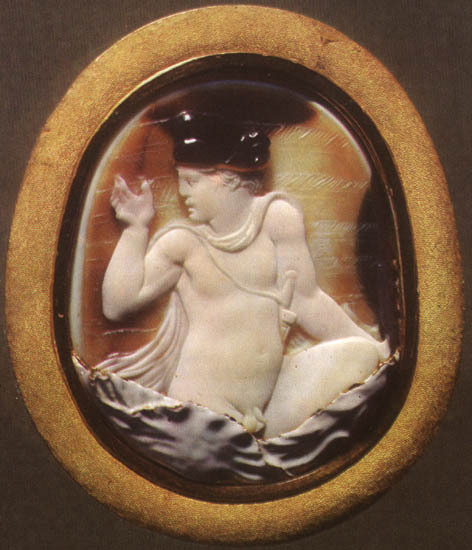 Fragment of the cameo. For analogies, see: Paris, Bibliothèque Nationale; Babelon, Catalogue, N 6, pl. 1. OAK za 1881, str. 111, tabl. V; Maksimova, Reznye kamni, str. 96; Reinach, Pierres gravées, p. 135, pl. 123.